I Love My Amazing Animals: Has it been a year already! Has it been a year already! I remember last year when the first worldwide moment took place. It was nice and it gave us a minute to reflect, pray and think special thoughts of our bloggy friends that we have grown to appreciate. I can't believe it is almost a year already and I'm still blogging and still making new friends. So on Sunday, November 10 at 11:00PM GMT (6:00PM EST), I am going to do just that. 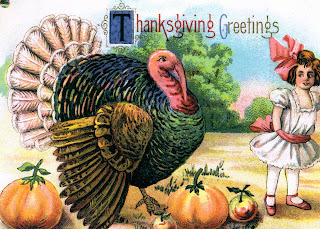 Take a minute for reflection, prayer and to give thanks for all my bloggy friends. Please feel free to visit either of my two friends for more information: The Chronicle of Woos or Two Special Wires. Please spread the word, this is an International event, where we can all join together as one global community. All you have to do, is leave me a comment and send me your snail mail address to dgm1930(AT)gmail(DOT)com and I will gladly mail you this lovely note card. All I ask, if I could put your name on my Penny Ellen site as a sponsor, that would be great! I am also sending $ 1.00 to SPOHNC (Support for People with Oral Head and Neck Cancer) for every card I send out! Even if you don't want me to put your first name on the Penny Ellen site, that's OK, I will still send you a note card! This is just my way of saying thank you for following us! Your all appreciated! I've been thinking of participating in this too. I really need to copy down the date and make sure I get it posted in time. I have never heard of the Worldwide Moment, what a good idea!Glad you are spreading the word! WE like the sound of a worldwide moment, we like it a lot. THat is coming from three who believe in Random =acts of kindness or should it be random cats of kindness. 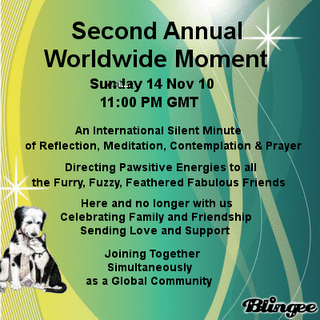 Having only been blogging this year I'm so happy to learn about the international minute's silence for all our furrfriends who are now at the Bridge!! It's a brilliant way to remember them!! Good luck with your giveaway...what a loving thing to do for your best friend and sister in law. We send you and your family lots of prayers. Grrreat event! We'll pawticipate too! You are such a kind person to do that. We are very excited to participate again in this special worldwide moment. I am ready for the WWM too!